The journey may be gruelling, but it does come with a perk — a salary that most British workers can only dream of. Last year, Mr Woodhead pulled in a hefty £292,137, equivalent to roughly 11 times the national average wage. Yet if you thought this sort of fat-cat package was reserved for high-flying bankers, City lawyers, and hedge-funding members of London's corporate elite, think again. For this 58-year-old graduate of the University of Huddersfield is actually on the books of one of our most generous state employers. He's the Customer Service Director of Transport for London (TfL), a quango run by London Mayor Sadiq Khan, which is in charge of the capital's road, rail and bus networks. Woodhead is just one of 63 TfL staffers who last year took home more than £200,000, and sits in the third tier of the organisation's managerial flow-chart. Last week, he was at the centre of a heated party-political row. 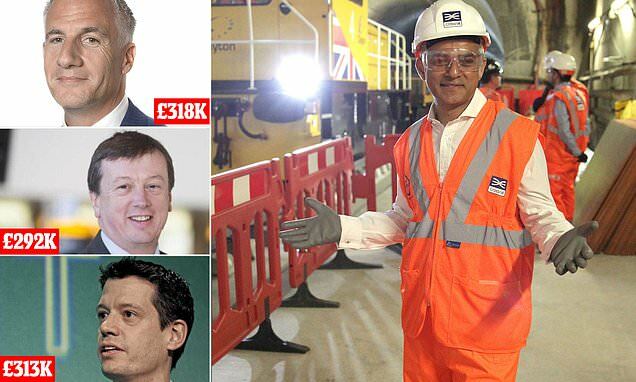 To blame was a press release by the London Conservatives, accusing Mayor Khan of wasting tens of millions of pounds on 'eye-watering pay rises' to TfL staff. The document contained extraordinary revelations about employment practices at the organisation, alleging that behind the steel and glass exterior of the HQ in Greenwich, South-East London, Khan is presiding over a culture of untrammelled corporate excess. It noted, for example, that TfL's 26,994 staffers last year took home a combined £2.25 billion, according to its last annual report. That equates to an average of £83,337 each. The gargantuan, some might say scandalous, figure is unrivalled almost anywhere in the public sector. It's higher than the equivalent at some of London's major finance houses.